CDC unveils national obesity rates: Where does your state rank? (CBS/AP) A new government survey shows 12 states now have very high obesity rates among its adult residents. The Behavioral Risk Factor Surveillance System telephone survey from the Centers for Disease Control and Prevention gathered a nationally representative rate of Americans across the U.S. by calling 400,000 Americans in 2011, asking them about their height and weight. What did the survey show? Overall, more than a third of adults are obese, similar to earlier reports, but rates differ by state. State rates remained about the same although the number of those with very high rates went from nine to 12. That signifies that at least 30 percent of adults are obese in Alabama (32 percent), Arkansas (30.9 percent), Indiana (30.8 percent), Kentucky (30.4 percent), Louisiana (33.4 percent), Michigan (31.3 percent), Mississippi (34.9 percent), Missouri (30.3 percent), Oklahoma (31.1 percent), South Carolina (30.8 percent), Texas (30.4 percent) and West Virginia (32.4 percent). Colorado was lowest, at just under 21 percent obesity, and Mississippi was highest at nearly 36 percent. 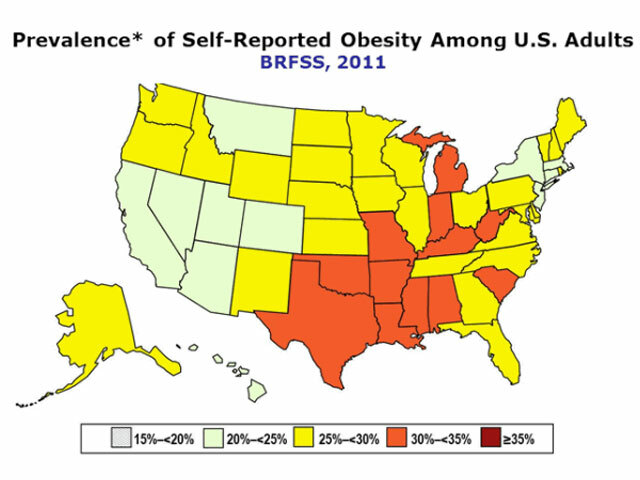 No state had obesity prevalence under 20 percent and 39 states had a prevalence of 25 percent or more. A time-lapse map on the CDC's website shows obesity in America dating back to 1985 through 2010 - the map over time becomes more colorful as it approaches current rates of the obesity epidemic. To see where your state stacks up, visit the Centers for Disease Control and Prevention.